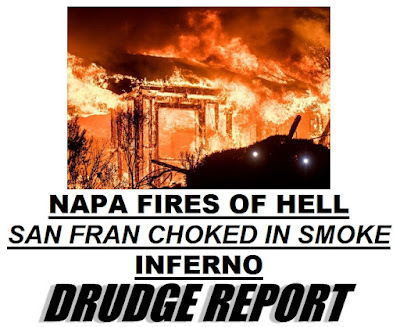 My hometown (Napa, California) is in flames. The sheer quantity of fires which sprang up overnight and roared into infernos before winds of 35 to 50 mph makes me think arson is the cause, though that's just speculation on my part and has not been confirmed. But whatever the source, fires through Napa and Sonoma Counties are clocking a tragic toll of burned homes, businesses, and wineries. 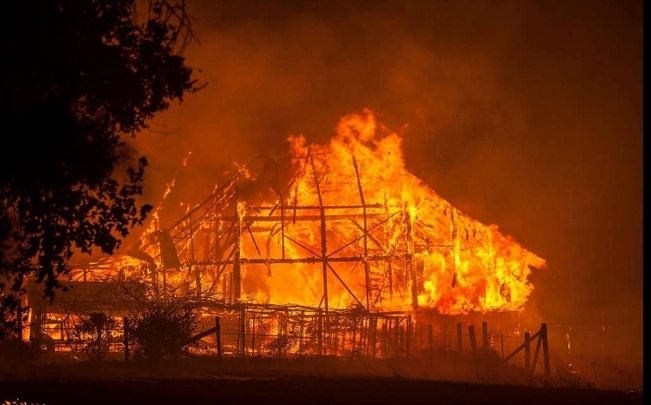 It breaks my heart to think of Wild Horse Valley Ranch at one end of the region (where I took horseback riding lessons as a kid) to Stornetta's Dairy at the other end (where every schoolchild took multiple tours) being burned -- not just because of the structures and livelihoods, which are bad enough; but because of all the animals (horses, cows, etc.) unable to be evacuated. This article noted, "For long time Napa Valley residents the massive fire rekindled memories of the 1981 Atlas Peak wildfire. In that blaze, 23,000 acres were burned, $36 million was done in damage, 65 structures were destroyed and 11 people were injured." I remember the Atlas Peak Fire eerily well since it nearly burned us out. It was terrifying. Please pray for the hardworking emergency personnel and firefighters, as well as those displaced or burned out. If there are any blog readers in the area, please check in to let us know you're safe and to give us news. What a waste, and dangerous besides. Many things in people homes are irreplaceable. I wonder if the idiot that said fires somewhere were God's revenge on Trump voters will say anything about California's voting. My son works for CalFire. I am unable to reach him so I assume he has probably been sent to these fires. If I get information I will forward it on. In the meantime prayers are always appreciated. My son would be blessed to know that people are praying for him. We will pray for all the people working in this horrible situation. I have never been an 'animals first' kind of person. But it amazes me that when we hear about any kind of wild fire, no one mentions the horrible death that many creatures, tame and wild, came to. Even the fastest can't outrun some of these fires, and what about the ones that are not built to run. Like the porcupines! Poor ol' Pricklies! Our hearts go out to all the life that these fires have not only endangered but taken. We ask Our All Mighty Creator to give rest to their souls and comfort to those they left behind. Shalom! We are further south of there by a few hours, but have friends in Napa who, so far, are safe. Faring equally bad or worse is poor Santa Rosa though, where the fire went through the middle of the city, burning blocks and blocks of homes, shopping centers and even the Hilton in town. I think there are something like 18 fires burning up there. I've always thought that if you lived in town your house was safer than if you were living in the dry, brushy CA hills. I also thought if you were surrounded by miles of green vineyards or other farming operations, your possibilities of burning were low. On both counts I was wrong, sadly. Unfortunately, to a fire a house (if made of combustible material) is nothing more than fuel. Homes in cities can burn just at easily together as those surrounded by flammable trees and brush. If you look at the history of wild fires in the early part of our country this was made evident. The greatest loss of lives in wild land fires occurred in Peshtigo, Wisconsin on the same day that the Great Chicago Fire occurred. Hundreds lost their lives but it was not widely known because of slow communications from rural areas. Many other "rural" woodland fires occurred in forested states because logging practices did nothing with the branches and left overs from removal of the logs. These cut over lands became tinder boxes just waiting on the right conditions to erupt in vast Fire Storms. In Hinckley, Minnesota many lives were lost when weather conspired to create one of the greatest fire storms in our country at the time. It occurred in the late summer when a dry cold front pushed winds through the area. Existing fires from logging debris that were left to burn out on their own were the ignition source. Many wonder why some homes survive and others do not. They appear capricious and random but often are not. Fire behavior has been studied for years and predictions can be made on the susceptibility for buildings to burn and the proximity to adjacent flammable fuels is often the key. Having a structure of less flammable material can offer a measure of protection. The sad thing is when people want to locate in forested/ or brushy areas they build log cabins, put wood shingles on the roofs and sometimes even have pine straw for mulch around the homes. I can't think of a more hazardous product to have in a fire prone environment. Litter, debris, etc. that is not cleared from homes is the ignition source for most homes. Sad but true. Our cousin lives in Santa Rosa, she and her family evacuated their home. Their neighbors homes have burnt down, her block, the only homes standing.